we anticipate 2016 will bring the rise of the green kitchen. Evergreen cabinetry acts as a neutral in this sleek kitchen. Secure its place as a background color by throwing a hot pink rug on the floor. Mint may have been big in years past, but it’s clearly not going anywhere any time soon. This color has staying power. Embrace it in the form of a tiled backsplash. Shades of green inhabit this cool toned kitchen. The cabinets, tile and bar stools all work beautifully together. Kelly green cabinets make this simple kitchen cool. Open shelving adds an additional layer of freshness to the lush space. For a quick introduction to color, change up your walls. Spruce up your tired backsplash with gorgeous greens. Deep green mixes with dark wood for a masculine vibe. Add in copper elements to complete the look. 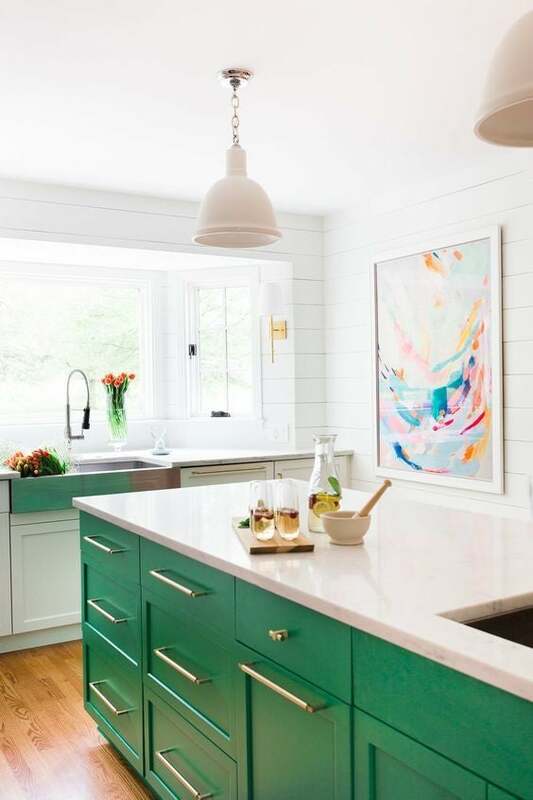 Vibrant verde lower cabinets pair perfectly with this colorful artwork. Adding artistic elements like this into your kitchen help it to connect with the rest of your home. Seafoam colored cabinets are soothing in this rustic-walled space. Black fixtures pop against a cooling color. This two-tone kitchen is one to make you green with envy. Pair these fresh colors together for a lively mix. Golds and greens elevate this space from a standard kitchen to a luxury suite. Guests will flock here, when you host your next big shindig. Welcome that little green-eyed monster, lurking around the corner. Friends and family will be emerald with envy every time they enter.